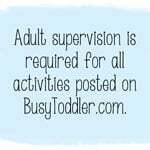 Do you have busy toddler? 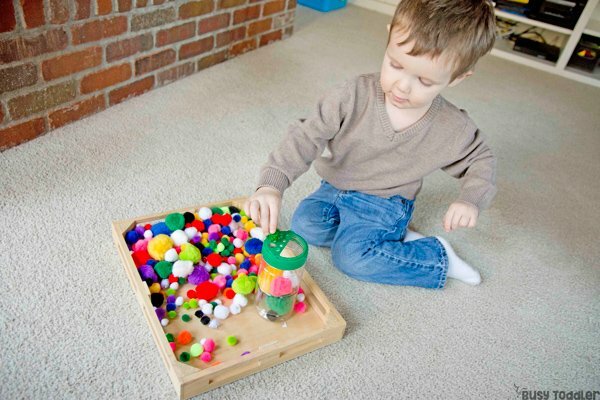 Try making a pom pom pushing toy. This idea was just plain magical. Every now and then, I help out Future Me and save something that might be useful. Past Self and Future Me don’t always get along or set each other up for success so it’s a nice change of pace when this happens. At some point in my past life, I saved a Parmesan cheese container and left it all cleaned & ready for the future. I’m not sure when it clicked but it did one day. And I knew exactly what to do with that silly little container. I ran to grab the pom pom balls. The top of the Parmesan container is full of holes – one large slot, three medium holes, and a few really small ones where the lid attaches to the top. I started by removing the lid from the container which took nothing more than a little elbow grease and a hard tug. I had the most perfect little container for shoving stuff into. Nothing is better than a “shoving” activity. 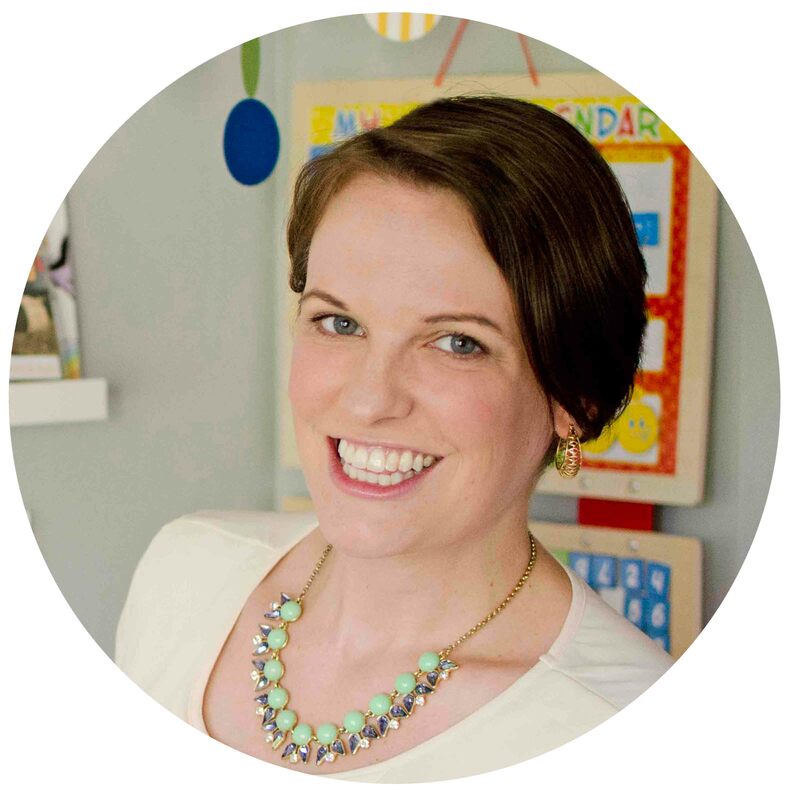 Call me crazy but I know for a fact that my kids love “shoving” and “dropping” and “pushing” activities. They love pushing playing cards into an oatmeal container. They love shoving pom pom balls into a Christmas tree box. They’ve loved pushing crayons and straws. Where did I get those pom poms from? 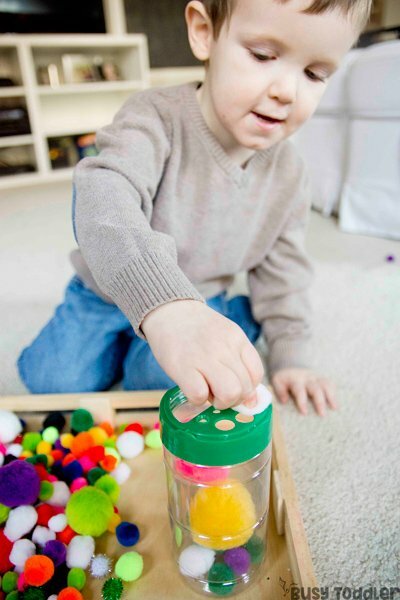 I knew this pom pom pushing toy would be perfect. 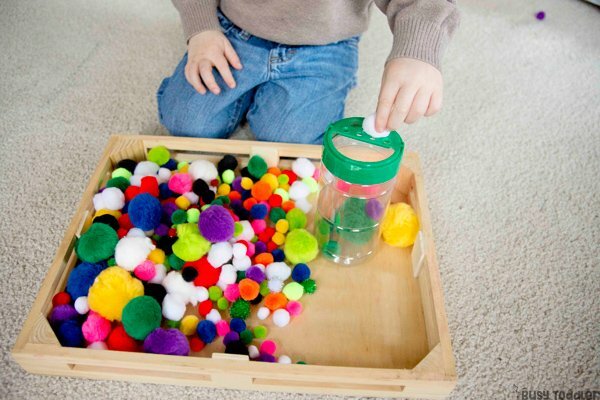 I set the Parmesan cheese container on a tray along with a giant handful of pom pom balls. I put this on a tray to help keep things somewhat tidy. I always like to define the learning space like this – makes things seem more “official”. Thank goodness I saved this container! 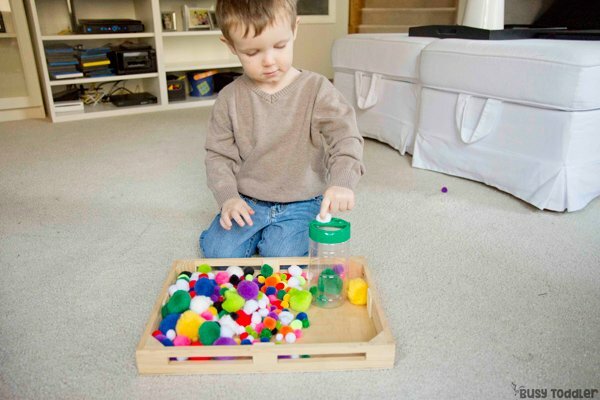 I’m not kidding that my toddler (27 months) did this activity for 30 minutes. He went back to this over and over for a week. Remember that pom pom balls are not taste safe and are a choking hazard. 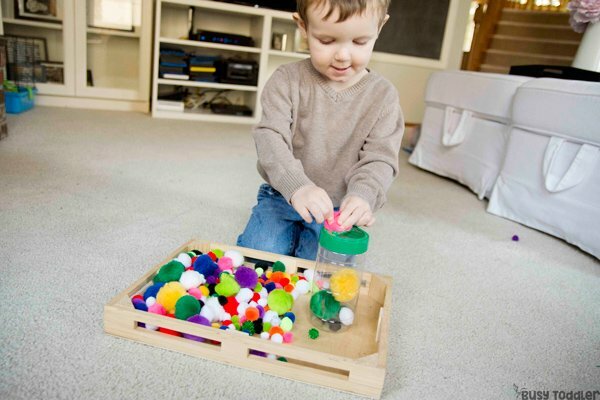 Use good judgement when deciding if your child is ready for pom poms. Always supervise this (and every) activity. 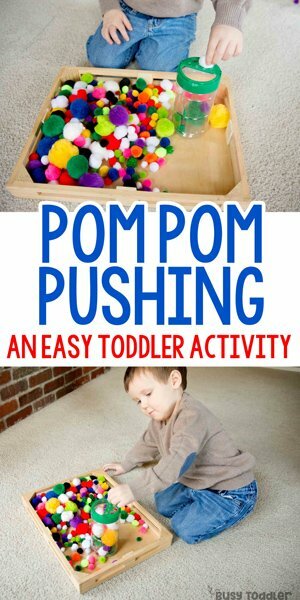 Save your containers – make a pom pom pushing toy! 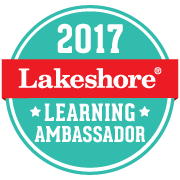 Trust me on this – do Future You a favor and try this activity. Even my 5 year old had to play a round with it! 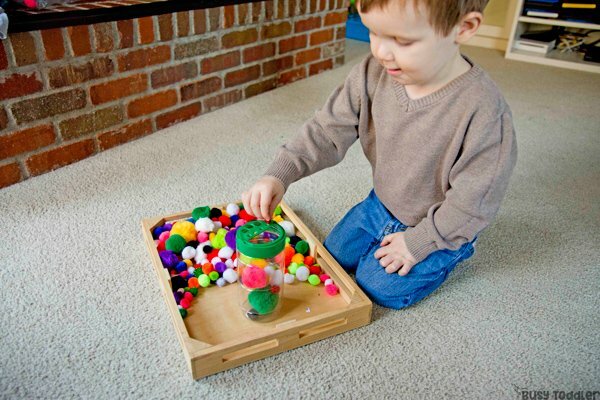 The pom pom pushing toy: forever showing that great toddler activities do not have to be a giant production. 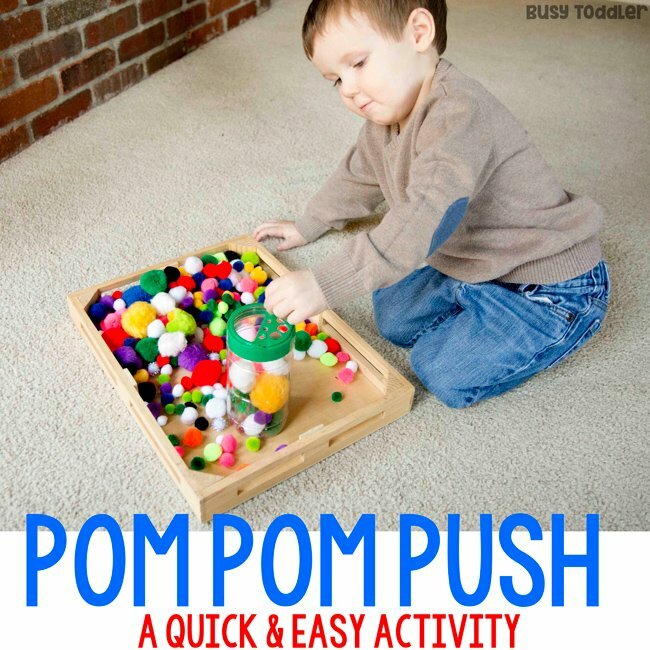 When will you make a pom pom pushing toy?